Born in 1951. Bradford, England. Lives and works in London, England. 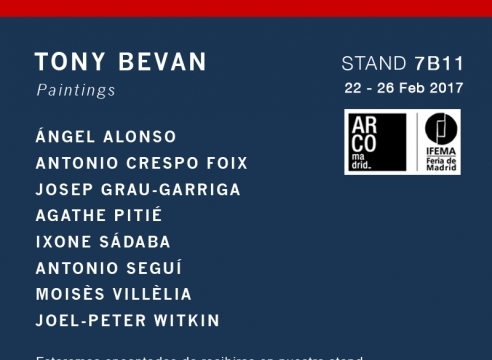 Tony Bevan is widely acclaimed as one of the leading figurative painters at work today, following in the footsteps of School of London artists such as Frank Auerbach and Francis Bacon in their reinvention of form. His focus on the vulnerability of the human body and frequent use of his own body in his painting also allies him to artists such as Georg Baselitz, Philip Guston and Arnulf Rainer. 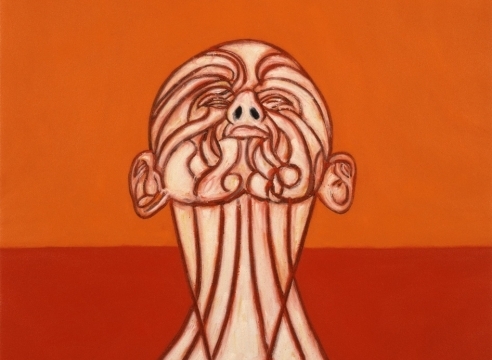 Since his early works Tony Bevan paints single figures in a manner that suggests extreme psychological states. His use of charcoal and intensely chromatic acrylic paint, which he makes himself, give his painting a distinctively rich, scorched appearance. Bevan developed his psychological portraiture throughout the 1980s and 90s, often working in series on individual subjects. 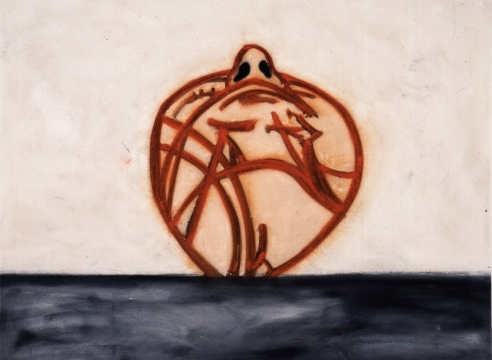 Toward the end of the 1990s Bevan stripped his images to a bare minimum, producing a disturbing series of paintings in which disembodied heads float like scarred, trussed balloons. In recent years he has also worked on abstracted architectural subjects such as corridors, rafters and stacked furniture which often expressing similar states of desolation, possessing a disturbing, uncomfortable presence. Tony Bevan studied at the Bradford School of Art (1968-71) and then in London at Goldsmiths College (1971-74) and the Slade School of Fine Art (1974-76). Since 1976, Bevan has exhibited widely, having his first solo US show at L.A. Louver in 1989. Bevan has also exhibited at the ICA, London; Staatsgalerie Moderner Kunst Haus der Kunst, Munich; Whitechapel Art Gallery, London; and Israel Museum, Jerusalem. A major retrospective was presented by the Institut Valencia d'Art Modern (IVAM), Valencia, in 2005. In March 2007 Tony Bevan was elected as a Royal Academician of the Royal Academy of Arts in London. He has participated at the Venice and Sidney biennials and his works can be found in many prominent international collections such as the MoMA, New York; Museum of Contemporary Art (MOCA), Los Angeles; Metropolitan Museum of Art, New York; Long Museum, Shanghai; National Portrait Gallery, London; and Tate, London. 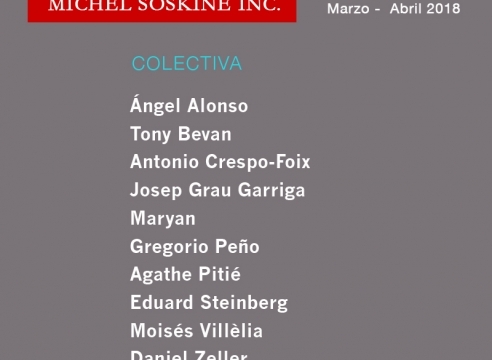 Exhibition catalogue: Institut Valenciá D'Art Modern, Valencia (Spain), 2005. 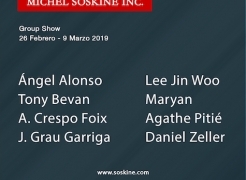 Text by: Consuelo Císcar Casabán, Kosme de Barañano, Klaus Ottmann, Jonathan Sinclair-Wilson. 330 pages: ilustrations (some color), hardcover 30 x 8 x 3 cm. Bilingual edition published in 2005 by IVAM, Institut Valencià d'Art Modern, Generalitat Valenciana (Spain). Lund Humphries Publishers Ltd, USA, 2006. Texts by Jon Bird, Kosme de Baranano, Klaus Ottmann, Jonathan Sinclair-Wilson and Marco Livingstone. English, 280 pages, hardcover, 27.5 x 3 x 30 cm. Bilingual edition published in 2005 by IVAM, Institut Valencià d'Art Modern, Generalitat Valenciana (Spain). ISBN: 84-482-4-151-7.